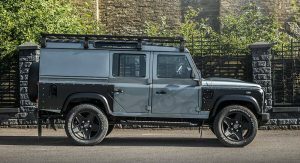 Until Land Rover decides to finally reveal the all-new Defender, the only chance we’ve got to scratch our British rugged off-roader itch is to check out some aftermarket projects. 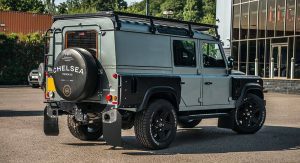 Chances are you can always find something new in Chelsea Truck Company’s garage but be aware that most of their projects defeat the original purpose of the Defender. 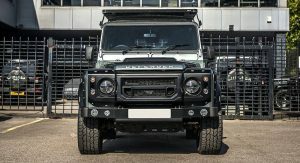 Nevertheless, the off-roader has long made the transition from a rugged workhorse to a fashion statement, as luxed-up versions are in demand. Take this one for example – a Land Rover Defender 2.2 TDCI 110 Utility Wagon designed by Afzal Kahn that’s currently up for sale on the aftermarket company’s website. 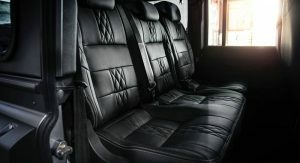 Ignore the “utility” part in the vehicle’s name because it’s chock-full of luxurious features. 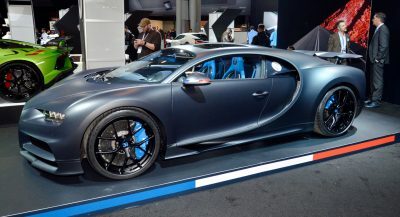 On the outside, it’s got the Chelsea Wide Track package which translates into broader front and rear fenders and 20-inch Mondial alloy wheels — painted Volcanic Black on this particular vehicle. 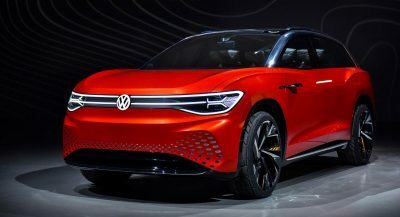 The bodywork features a custom Volcanic Mist Satin paint that contrasts with the black fenders, wheels, and front grille. 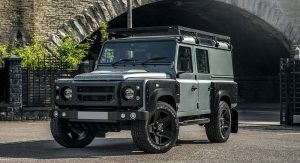 The pimped-out Defender also sports a black bumper with integrated lighting and skid plate, as well as a massive roof rack. 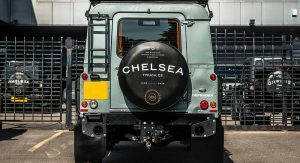 Rounding off the styling tweaks is a Chelsea Truck Company spare wheel cover. 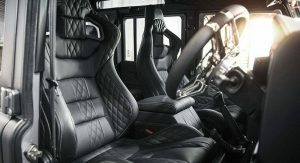 While the exterior features plenty of clues this is no ordinary Defender, nothing can prepare you for the cabin’s opulence. 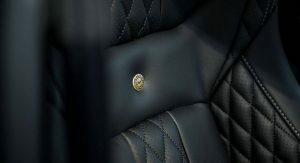 Behind the dark-tinted privacy glass, there are some exquisite GTB sports seats in quilted and perforated black leather. 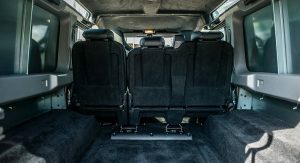 They set the tone for the entire cabin, as the center glovebox, passenger-side dashboard, grab handles, door panel inserts, instrument binnacle, rear door panel, roof headlining, and sun visors are all upholstered to match. 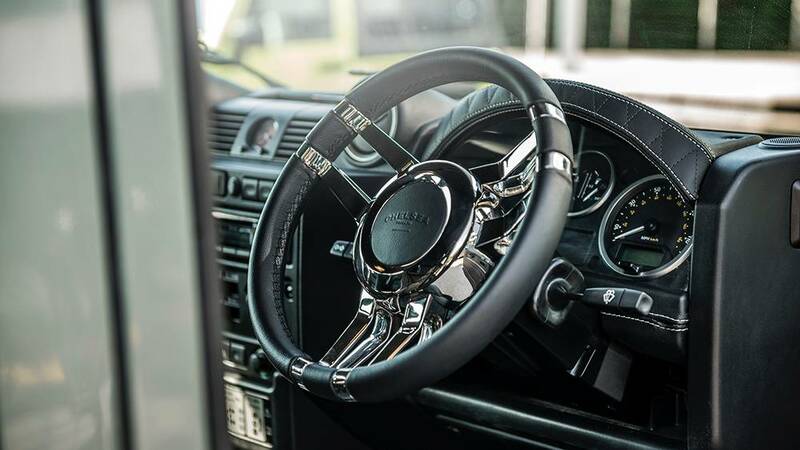 Other updates worth mentioning are the Kahn billet steering wheel, Churchill time clock and speedo/rev counter, and vented machined aluminum pedals. 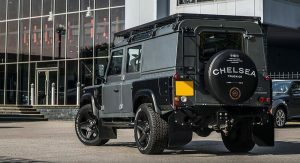 While nothing was done to the engine (it’s still the stock 122-hp 2.2-liter four-cylinder turbo diesel), the Defender’s hardware was upgraded with a suspension lift, uprated gas shocks, and a twin crosshair exhaust system. 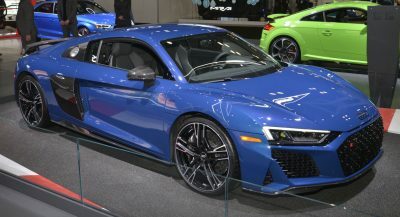 At this point, you should know that this particular 2016 model with 10,562 miles (16,998 km) on the odometer is available for £59,999 (approximately $78,610). 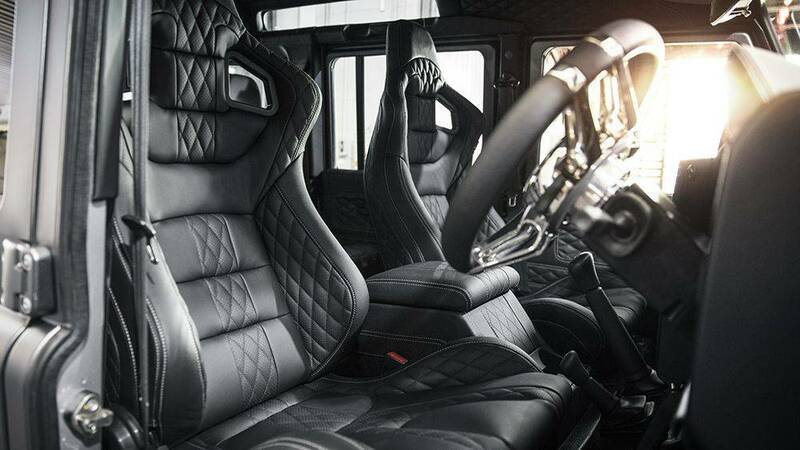 The interior is poor at best. They could have done better. It’s good for what it is. It’s luxurious in a stand alone state or way. Love it. The heading made it seems as if it’s an ultimate luxury thing. put make up on a goat? 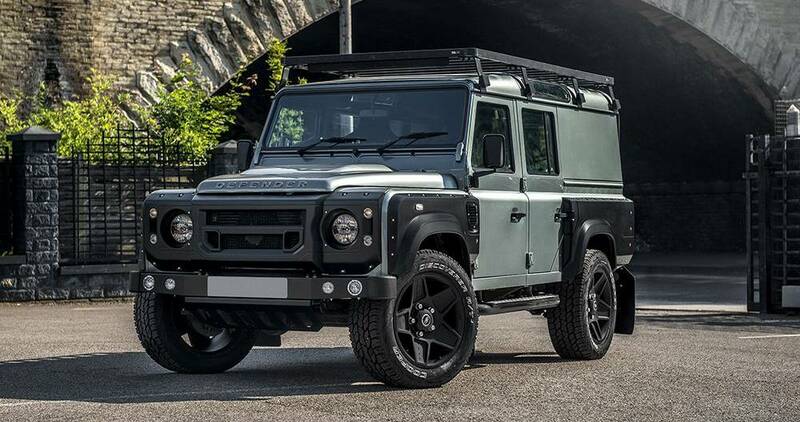 well i like my goat plain… by no mean i dislike the LR Defender. on the contrary, i like mine original please. Ughhh Azfal Kahn again, never like his creations.